Writers write; they don’t just compose when it’s convenient for them, when the stars are in alignment, or when they happen to be sitting in front of their computers. Snatches of dialogue, scenes, or entire outlines can be lost because the muses don’t wait to inspire you until you’re in just the right place with just the right tools. I don’t mean to suggest that we’re powerless before the goddesses of inspiration, nor do I mean to belittle the ability to simply sit down and focus and make writing happen even when you’re having a slow day. Writers have to be able to make writing happen, not to wait for it to happen. What I’ve advocated is having a small notebook (and a mini-pen) ready with you so you can write rather than NOTwritetm, which is infinitely easier. Whipping out your pen and notebook is much faster than rifling through your laptop or mini-laptop case and waiting for the computer to cycle on. In many of the instances I described above, firing up a computer would be impractical enough that you’d probably leave the writing for later. If I’m waiting on a really slow train to get by, or stuck on a plane, or twiddling my thumbs until my child’s track meet starts, I can grab my notebook. I could type on my phone, but I hate typing with my thumbs. I’m MUCH faster with a pen. 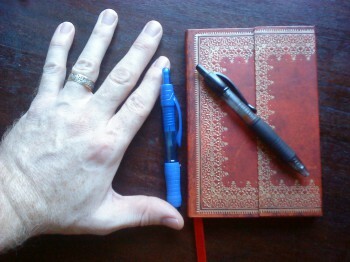 A writing notebook is one of my most important tools, nearly as important to me as my laptop. I don’t just use it to jot things down when I’m away from my desk. I like getting away from the computer to brainstorm and list possible directions the plot could go, or to work out a character’s background details, or simply to organize my thoughts. When I get to the final pages of my writing notebook I used to pick out the newest Paperblanks model and get to work. This year, though, I couldn’t help noticing that my Paperblanks mini was falling apart in the same way that several of its predecessors had. I’d already glued its binding back once before. It turns out that the part of my notebooks that get the most wear and tear are the corners and the hinges, likely from getting tugged in and out of my pocket. The Paperblanks models with flaps have more points that bend, which means more places to break down. I wish it weren’t so, but I guess my pocket transport just isn’t very kind to them. I love my Paperblanks, and I really don’t think this problem is indicative of poor quality construction. I have friends who carry Paperblanks in their purses and they don’t have the same kind of wear and tear problems. Still, I got to wondering if perhaps it was time to try out some other models that might be more rugged. As I mentioned the other week, I discovered an entire online community of notebook enthusiasts. It was a little overwhelming, but it was also educational in that it got me thinking about what features of a writing notebook were most important to me. Once I had my preferences in mind it was much easier to sort through the massive amounts of product reviews and winnow down the options. Fortunately, some thorough notebook reviewers had already vetted every one of them, or a style in the same product family, so I could be assured of factors like binding and durability. In the hope that you might find a similar notebook of benefit to your own writing, in the coming weeks I’ll describe the features of the best pocket writing notebooks, because it turns out they all have their strengths. Before I do that, though, I thought I’d explain my criteria. And I’ll do that in part 2. Here’s the dedicated page that shows you a little about all the notebooks that meet my criteria. While I do still have stacks of notebooks and typically have a favorite pen and paper handy, I try to do more of my notes electronically these days. Even before smartphones, I specifically sought out a PDA that would allow me to write on a screen with a stylus. Now, I use a Galaxy Note 3. Admittedly, it has better stats than a lot of tablets, but I really wanted it for the “Note” part of its design. It has a lot of memory, lets me break things into individual files that even look like little notepads on-screen, offers a wealth of colors and pen tips, and modern processor speeds mean I can get into it about as fast as opening and scribbling on paper. I really do like the handwriting part (sometimes incorporating it with photos if I’m of a mind to). We still have an important neurological connection that goes along with writing things by hand. That’s one of the reasons I’m surprised the “pentop” computer hasn’t seen better progress, but I think the requirement for special e-paper had a lot to do with that. Likewise, I’ve had little use for tablets because I also like typing. Again, it’s a tactile thing. I’ve always liked the idea of the fliptop laptops, but only feel they’ll be useful to me when my handwriting can be reliably translated directly to type. I think the price on those has to come down a bit before I go that route. I’ve never tried much stylus on screen writing, but I surely agree that there’s a pleasure to taking stylus in hand and creating your words with one. I wonder if I’d enjoy writing on a screen? I haven’t felt a real connection to it so far, but its admittedly been years since I’ve tried. If I took up writing up my phone it would mean one less thing I was carting around in my pocket!